Naughty and Nice is sort of my thing this year for Christmas. Well, not in my personal life, but I have several more projects to come with this little theme in mind. This week's cupcake challenge at Hoosier is a Christmas cupcake. Instead of really focusing on new and innovative flavors, I started thinking about a 'wow' factor in delivering said cupcakes. I saw these little plastic ornaments at Hobby Lobby, and I snagged 'em. I baked up chocolate cupcakes/icing, and used black sprinkles for the Coal Cupcakes (you could also use crushed oreos), and then vanilla, butter cream, and the good ol' ziplock piping bag for my Gift Cupcakes. I added some shred inside the ornament before snapping them shut to keep them in place, some string to hang them (though I could have also made little circles of paper to rest these on a table with a name (think: Easter egg stand).....that could potential be a lot of fun. I'd probably need to switch the names 7 times before we even made it to dinner based on the current treatment I was receiving from my guest). I'll be adding more ribbon and tags with the rest of these guys, but you get the idea. I looooove these ornament balls. They are about a dollar, but I anticipate they will be even cheaper after Thanksgiving. I always hang something from my chandelier for the holidays. Why not dessert? 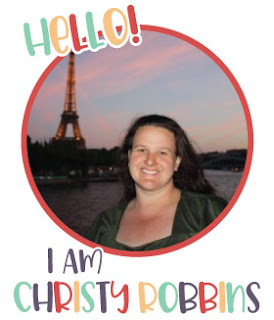 What a fun idea Christy! You are so completely COOL! 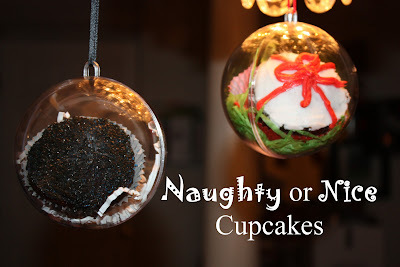 This is such an awesome idea of putting cupcakes inside Christmas balls. Hmmmm? Creative wheels are spinning. Thanks so much for the inspiration. Thanks so much for joining us for the Cupcake Challenge! What a cleaver idea. An adorable gift. And, what a great way to display your Chrsitmas party favors. On the way home, your guest can take a ball from the tree. Love it! 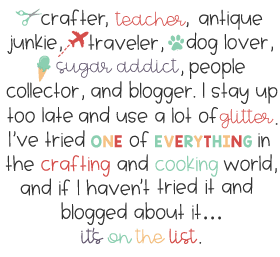 I love that - something new and different...great idea.